A new report in the Financial Times (FT) says that Microsoft is looking at expanding its retail outlets to the European market. A “person familiar with the talks” says that Microsoft is talking to UK property landlords about possible bricks-and-mortar store sites and scheduling the first outlet launches for 2013. However the trigger will only be pulled if the US stores have performed to a level satisfactory to Microsoft’s strategists. In the US, Microsoft Stores follow a similar format to the Apple Stores. However unlike the Apple stores there is a lot of third-party hardware in Microsoft Stores; such as the smartphones by HTC and Nokia and well-known PC brands like HP and Samsung. Of course, Xbox products and Microsoft Surface tablets are showcased and also on the hardware side of things there are Microsoft input peripherals. Where Apple Stores have “Geniuses”, Microsoft Store employees are more accurately called “Technical Advisors”, but of course both are just there to flog you stuff. 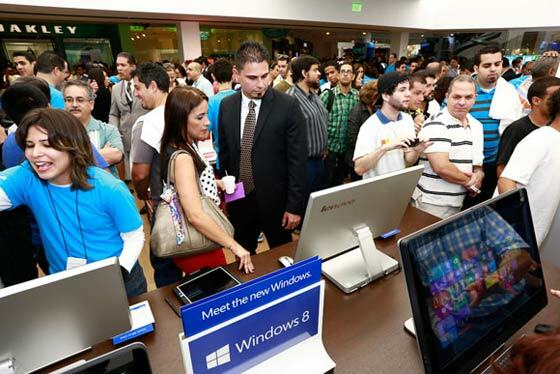 Microsoft also offers software training at its stores in the US by “Specialists”; these employees are trained on demonstrating the new Modern UI of Windows 8. The company seemed to be trying to teach users how to use the dramatically different interface in TV adverts recently and the “Specialists” aim to do that task in-store. 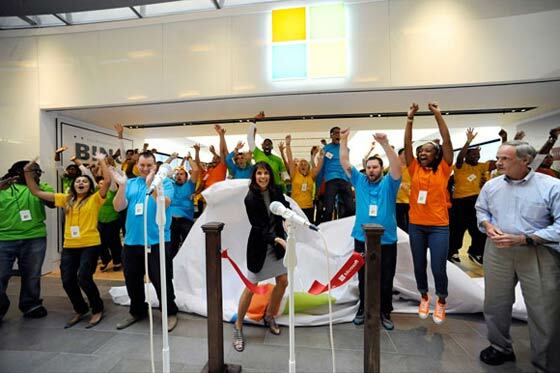 The FT says that at the end of 2012 Microsoft will undertake an analysis of its retail store chain’s performance in the US. Following this study and depending upon results the European retail stores will be given the green light. I hope we do get a few Microsoft Stores on this side of the Atlantic, it would give bored male shoppers more to look at while being dragged around the shopping mall (Ed. - centres, not malls) at the weekend. *Fingers crossed* can't wait and should be great but I would start to wonder about retailers such as the Dixon retail group who do sell a large range of products which any Microsoft store will feature. I for one really hope they open a few stores, preferably one close by! Really want to get my hands on a Surface or Surface Pro and see what it's like before spending that much money on something! Oh lord. MORE dancing, clapping pseudo-nerds there to annoy me with their incompetance. Good-o. Surely can't be worse then the rest of the high street? I'd say Apple store employees know more about iStuff than the average shop employee and shopper, if Microsoft can replicate that it should be a positive thing. Can't help but laugh after seeing the big windows logo above the store, apple style. It would be nice for less boring stores, though!